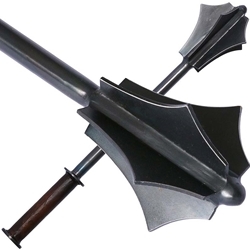 The rounded flanges, flattened finial and 20 1/2 inch long steel shaft make this Battle Ready Flanged Mace a good choice for the foot tournament. Comes with a leather and wire wrapped grip with two steel guards and a leather wrist strap. Approximate weight is 3 lbs.